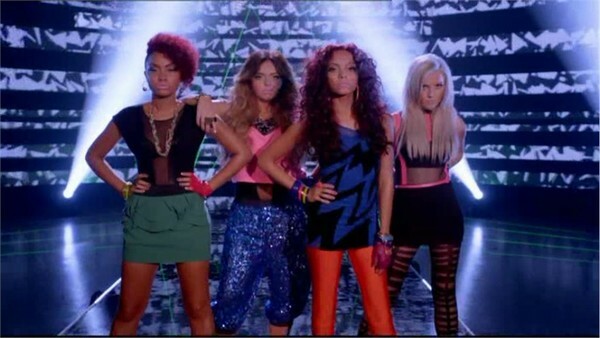 Little Mix, originally called Rhythmix, are contestants on X Factor 2011. Jesy, Perrie, Leigh-Anne and Jade all entered The X Factor this year as solo artists. They were given a second chance at the final stage of Bootcamp when the judges decided to put them into groups. The groups they were put into didn’t work out for the judges, and the girls were given a further chance at the end of Bootcamp when they were put into a group together and Rhythmix was formed. Jesyloves music, dancing and singing and has wanted to be a performer since the age of eight. She also has a trainer obsession and owns 90 pairs. Her favourite pair are Adidas Mickey Mouse Hi-tops. Perrie is named after Steve Perrie, the lead singer of Journey, as her parents used to be punk rockers. After being put into a group at Bootcamp the four girls moved into Perrie’s parents’ home in Newcastle for a month to practice before going to Judges’ Houses. Leigh-Anne is so desperate to make it as a singer that, before entering The X Factor, she used to save up all her money to pay for studio time to record songs. Jade has entered The X Factor before and reached the Bootcamp stage but got no further. This time she’s determined to win everyone over and has even been to see a hypnotherapist to try to cure her nerves. Week three: Ke$ha – Tik Tok / Salt ‘n’ Pepper – Push it!